The Trendline (in blue) has been broken so our antenna are up for a possible change in trend. A price structure is forming but we still need two more signs to confirm that this is a Distribution (and hence major top) and not just a minor “blip” (which we’ll call re-accumulation of shares). The two missing criteria are: a Failed Rally (higher off this base that does not exceed the previous high) and a Sign Of Weakness (a major down bar, wide-spread on heavy volume). Until those items are met we can not confirm this as being a serious down turn. So now what? 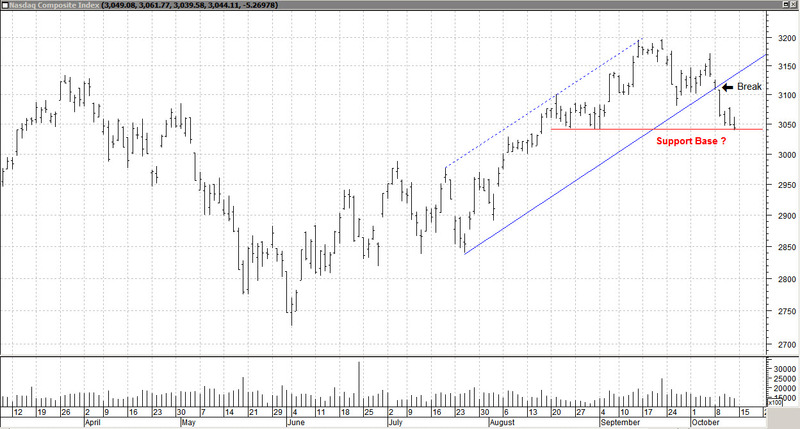 The red line in the chart shows the approximate level of support for this structure. Dropping and closing much below this level is not positive and will likely generate more selling. We’re at that point as of the close on Friday (today). And so this market waits. Waiting for earnings, news, geo-political, some or all of these but the volume over the last 3 days has been low. Volume is supply and a measure of activity, looks like waiting right now. How strong or weak is this market? The pie chart below gives us a sense of it. It shows the broad S&P 1500 stocks and where they are within their own trading range. 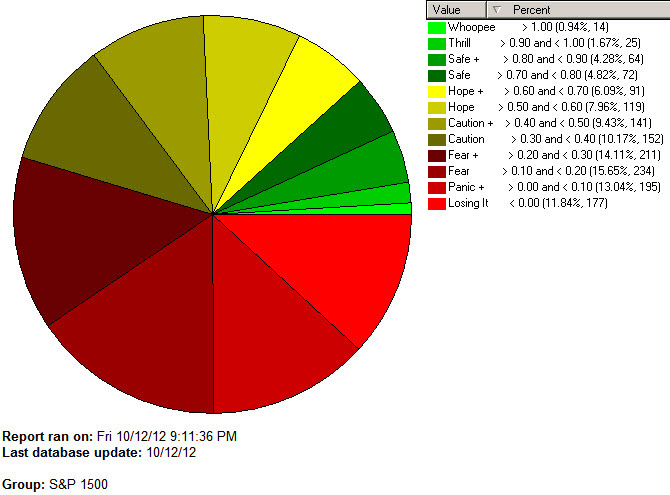 Shares of Green show price strength, Yellow neutral and Red in the low / weaker are of the range. What I see is weakness but not wholesale selling at this point. Now that may change next week, but for now just a digestion and consolidation of recent price gains. We’re overdue for this. This is earnings season for the 3rd Quarter. So far earnings are showing slowing growth. J.P. Morgan and Wells Fargo reported today. They were good but the concern was that earnings came from mortgages and that’s a short-term thing. The markets showed concern by lowering the prices on these bell weather stocks. Another reason why this market is waiting. Waiting to see what other stocks earn and forecast for next quarter. I’ve paired back on holdings to build up some Cash. If the market drops I will hedge out and may go short, if it rebounds I’ll get back in with the leaders. I can wait as long as the market can. It’s important to stay in-tune and in-sync. I’m trying to accomplish that. Have a good week and be especially watchful, we’re at or near a support level, attention should be paid. ….. Tom …..